The United Kingdom’s Conservative Party has today signed a new deal with the Democratic Unionist Party (DUP) to secure the support of their 10 MPs in Parliament. As part of that Northern Ireland can expect to receive £75m per year over two years to “help provide ultra-fast broadband“. A Summary of the Deal can be found online and at present this provides no information about how the extra investment will be distributed, although that’s no doubt more of a question for the DUP itself. 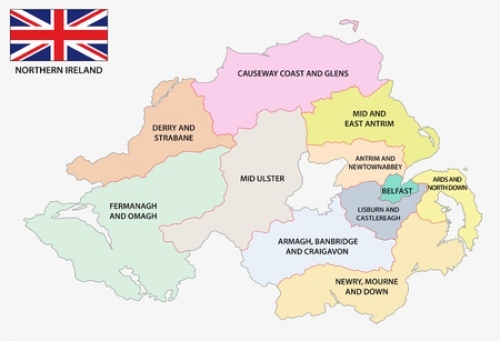 In its 2017 June Manifesto the DUP merely pledged to “develop a comprehensive Broadband Infrastructure Plan to roll out high speed internet connectivity across Northern Ireland,” which doesn’t tell us much. At present around 98% of N.Ireland can already access a “fibre broadband” (FTTC , FTTP or Cable DOCSIS) based network, although only about 82% of homes and businesses can expect to receive “superfast broadband” (24Mbps+) speeds (here). In terms of ultrafast (100Mbps+) coverage, over a quarter of premises can be reached via Virgin Media’s cable network and there’s also a tiny bit of FTTP. Suffice to say that N.Ireland might do better to focus on filling the sizeable gaps in their “superfast” coverage before they move on to tackle “ultrafast“, although they could also do both at the same time. We shall await more details and report back (it might take awhile before a solid plan emerges). The head of Belfast based telecommunications firm, B4B Group, which is currently completing a roll-out of FTTP broadband infrastructure in 9 business parks around Northern Ireland, has welcomed today’s news. Strange how the Conservatives busily cut public spending as there’s no money but can find it to keep themselves in power, isn’t it? How May can claim to now act independently for the Good Friday agreement, I don’t know. Buy every group of 10 Tory MP’s for a further £billion? And can the state interfere with the Ultrafast market yet? @MikeW Too early for anybody to answer your last question, although next month we should get some final details on the United Kingdom’s new digital infrastructure fund. Definitely possible for public money to help with ultrafast but it’s the usual question of where (outside of the obvious locations where no NGA at all exists today) and how to apply / award it. So the UK government is increasing spending of UK taxpayers’ money in the UK. Better in my view than wasting £13 billion a year in foreign aid (which largely helps despots to oppress their own people) and £10 billion a year net to the EU which undermines democratic accountability in 28 countries. If it keeps Corbyn and his Momentum cult members away from government(especially during Brexit negotiations), it’s worth it. NI has revenues of about £10 billion/pa and relies on about another £10 billion injected from the UK government each year to cover its total running costs of £20 billion/pa. This two year deal isn’t that much more really. It’s no worse than the Barnett forumula which the originator, Joel Barnett, has called a “terrible mistake” – but no party has the guts to change it because they’re effectively scared of angry Scots. Should have probably considered the possibility of my comment bringing out some UKIP fruit loop spouting Leave.EU / Aaron Banks / Robert Mercer propaganda before posting. My bad. The “fruit loops” are now the majority! The majority? 37.5% of the electorate voted to leave. And that was all on a pack of lies anyway. I’m still waiting for the £350M. And before you say we haven’t left yet, your demagogue confirmed it wasn’t true within an hour of the result being announced. The Leave campaign was all lies. Don’t get me wrong – I was on the fence when I voted – but I’m now a very strong believer that it’s better to stay in and reform the EU. And it is do-able. Thinking otherwise is just more UKIP hyperbole.